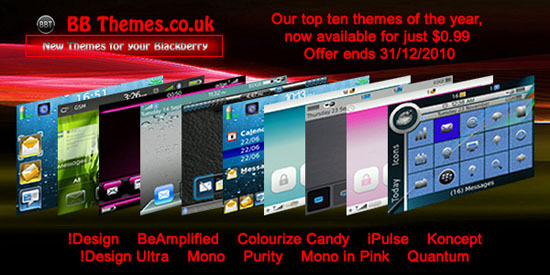 BBThemes end of year sale - 10 themes on sale for just $.99 each through Dec 31st! If you're still looking for that last minute Christmas gift, or maybe itching to buy yourself something but feeling guilty about spending extra money this time of year, worry no more. BBThemes has just announced their New Year's Sale on 10 of their most popular themes! Prices are reduced to just $.99 until December 31st so go ahead and grab as many as you like. You can choose from Quantum, BeAmplified, iPulse, !Design, Mono, Purity, Koncept, Mono in Pink, Colourize Candy and !Design Ultra. Get one, get several, heck buy them all! Give your BlackBerry a gift it can use year round.